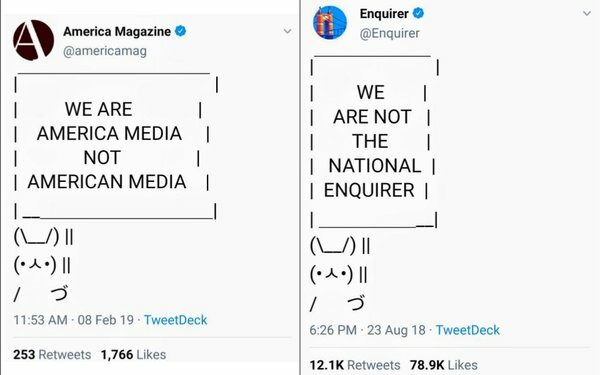 Sign bunny memes popped up on Twitter today from publishers seeking to distance themselves from American Media Inc., and/or its National Enquirer magazine. America Magazine, "the Jesuit Review of Faith and Culture," which goes by the Twitter handle @americamag, pinned a "not American Media" sign bunny to its Twitter account late morning. Cincinnati.com's Pulitzer Prize-winning @Enquirer retweeted a similar disclaimer that it's "not the National Enquirer," which has actually been pinned to its account since Aug. 23, 2018. At presstime, several other similar-sounding companies -- including American Media LLC and American Media Corporation -- had yet to capitulate.